Pam’s position, President Elect, succeeds to the office of President and assumes duties of the President in her absence. Her favorite part about being on the Board of Directors is having the opportunity to work with an incredible team of women. 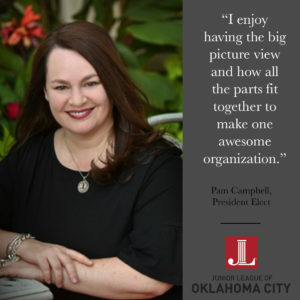 She knows that she is supported by a board who all want the best for the Junior League of Oklahoma City and are committed to its mission.